Harleys.de - where the legend lives on! The best about a Harley is the one who rides it! recognized by the government of Germany. Donations are taxdeductible. 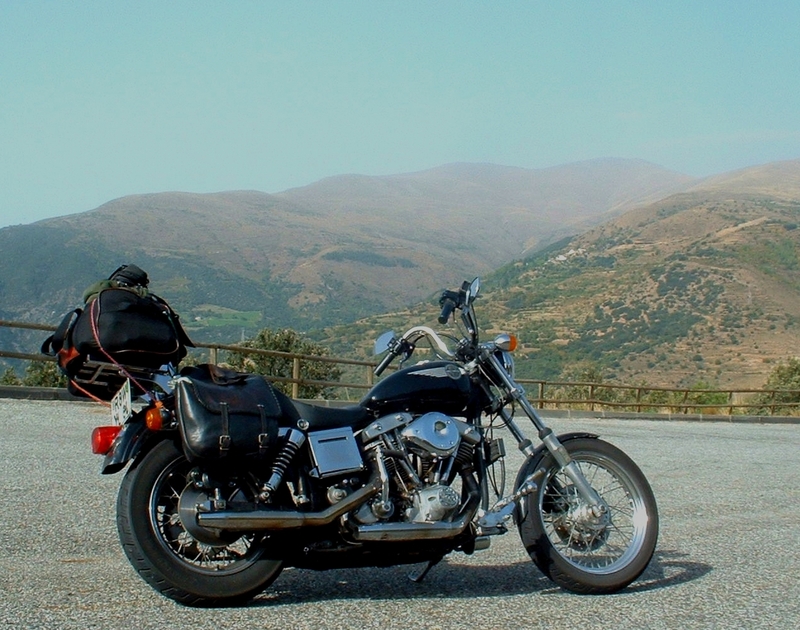 ...is the place for the those guys, who can´t leave their bike home and even ride in steady drizzle. Sure they know what to expect at Rauchs Café: the best coffee in the town of Bremen, Germany. For the realisation of your individual dreams and designs, as well as perfect craftsmanship, there was no other other place to go to, promised! It remains a secret what happened to the owner and his once successful business. not perform. There is no electronic ignition, which can blow its transistor. Just a set of contacts, a condenser, and an auto advance mechanism are taking care of the spark and its timing. No computerized thermo controlled fuel injection can fool you. The S&S carb is in charge, to deliver the right amount of gas into the combustion chamber, or the stock Mikuni, which also does the job. Precisely because of these old-fashioned features, Harleys.de considers this bike as the perfect long distance touring bike. Actually the only place you should not visit with your old sled, is the seaside camp ground in Pie de la Cuesta, Guerrero, Mexico. 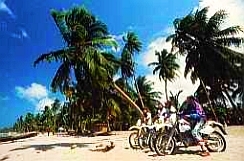 The salty pacific spray will penetrate into every single spot of your bike. And you really do not want to have that. Springtime, the first sunny days are coming up. The bike is tuned up to the best of your knowledge and it's time to get the old Shovelhead out on the highway. Warm up the engine and see if the she delivers the same power as last year. While revving her up you feel the steady boost towards the 100 miles per hour, which she is supposed to exceed. The oscillating indicator of the speedo tells you, that she clocked it already. Time to slow down, test passed successfully. And as you decelerate looking for the next exit, you hear the sound of an approaching spitfire. There it is, no it's not a Spitfire, it is..., no...., there w a s a motorcycle "cruising" at a speed of 140 mph or more. And as this highway is a public road, it couldn't have been "The Doctor" on his early morning warm up lap. But who the hell could be that silly to risk his and possibly other life by riding that fast? One single piece of wood on the road, one car or truck changing lanes, the driver not seeing, that there is somebody approaching with a speed of 76 meters a second. The rider won't survive. And we will be seeing more of that this coming summer: racing motorcycle riders giving a damn about the safety margin to the vehicle up front, maniacs overtaking, even when the passing lane has not been cleared yet. All this will happen on public roads, and with a strong focus on killing themselves. Truly an unforgettable adventure was the trip from La Ceiba, Honduras across Guatemala and Belize with Maya-Tours. Whoever has the chance, go for it!! You won't be disappointed, promised! "Riding a motorcycle on today's highways, you have to ride in a very defensive manner. You have to be a good rider and you have to have both hands and both feet on the controls at all times. 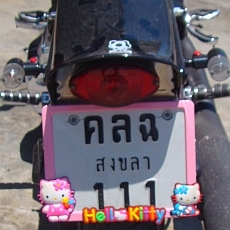 fashionable numberplate frame, Hello Kitty, sporting the Hello Kitty doll. It comes in glossy pink and white. Please inquire for prices and shipping. Hard to be seen, absolutely rare in original condition, but there is a pin striping on the bike in red, blue, and white, width and RAL colour codes still unknown to me. Is there anybody who knows more? 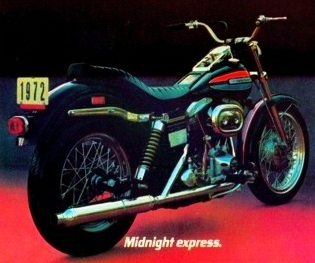 The 1972 "Midnight Express". This is the favourite model of Harleys.de. a 45 cu. Harley engine and fitted into a Norton feather-bed frame. Here you find the homepage of the complete collection.